I was feeling in the mood to be a bit fancy, so on Christmas Eve day I made a last-minute reservation online to go to ZenKitchen that evening with my partner. As soon as we went in we were greeted by Dave, who exclaimed, “How nice to see you! I didn’t realize you were coming in tonight!” There’s nothing quite like a warm welcome to set a good tone for the evening. Later Chef Caroline came out and said almost the exact same thing, so that must make it true! Vegan ravioli-- but you'd never know it. 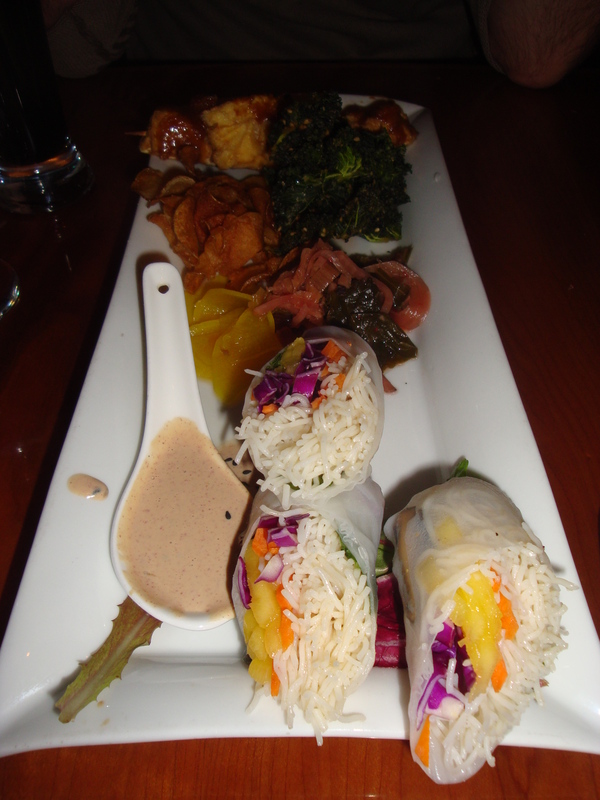 As is the norm at ZenKitchen, the server explained and offered the Four Course Chef’s Tasting Menu, but as someone who’s filled with a bit of anxiety over blind meal options I stuck to the menu. 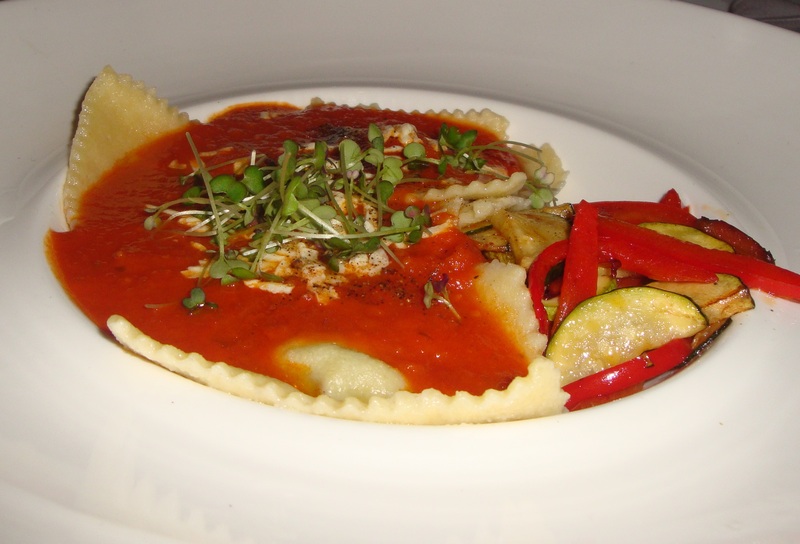 For my main course, I ordered the ravioli filled with pesto-cheese, with smoky tomato sauce and roasted vegetables. I’ve had it a few times now and it’s always delicious. It’s warm comfort food, and fairly filling. 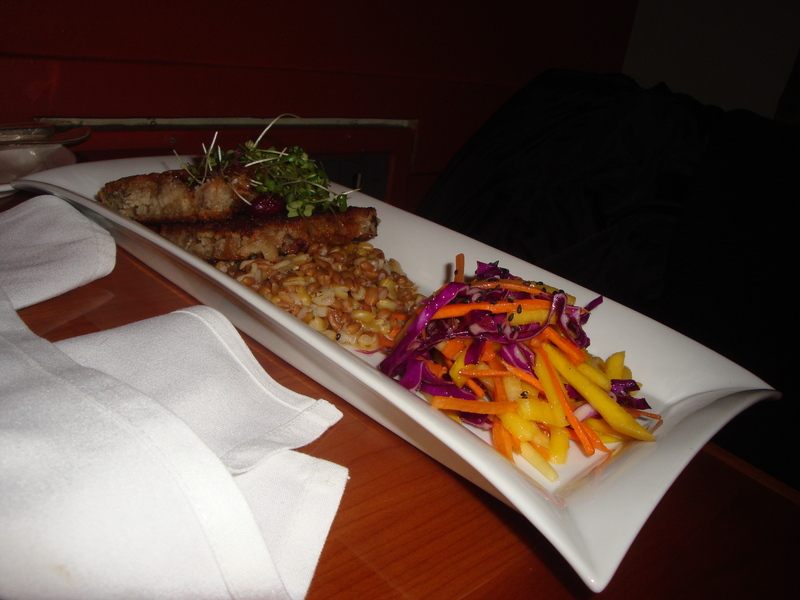 Yves had the Panko-crusted seitan medallions with a cranberry-teriyaki sauce, ancient grain pilaf, and Asian slaw. He was actually too full to finish it entirely, so I helped him out a bit. Truly a chocolate lover's fantasy. 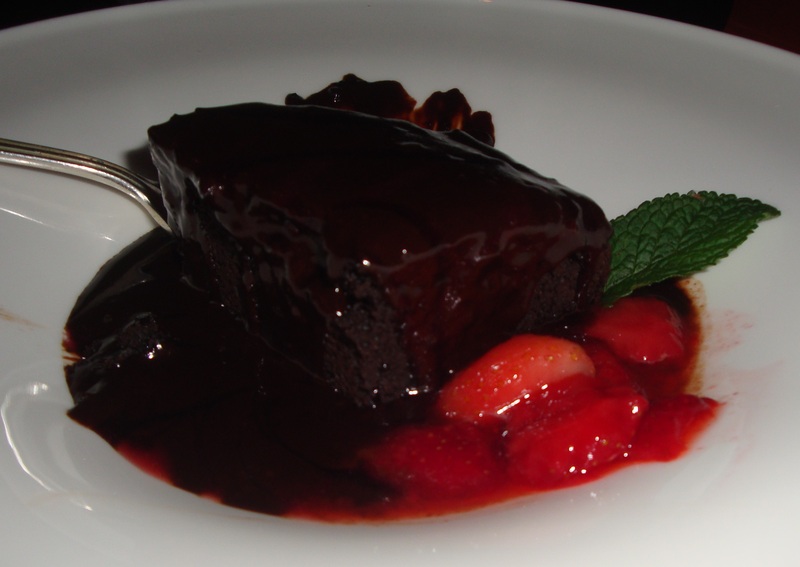 Because he was full Yves passed on dessert, but I had been salivating over the mere thought of the Spicy Mexican chocolate cake with warm chocolate sauce, creme anglaise, and berry coulis all afternoon, so I would not be deterred. I have to be honest, I can’t really tell you if the cake was extraordinary or not; it was so very smothered in the divine warm chocolate fudge sauce that it didn’t really matter. I’m inclined to say it was good, but frankly that sauce is so decadent it could make cardboard appealing. Suddenly and irrationally Yves became very hungry and I had to share some, but I still got my fill. It was, as always, phenomenal. Every time I have it I am inspired to create my own spicy chocolate desserts at home, and true to form within 48 hours I was baking Mexican chocolate cupcakes. But they don’t compare, and I anxiously await the next time I can partake in Chef Caroline’s unreasonably delicious concoction. After playing with the really cool sink fixture in ZenKitchen’s bathroom I returned to the table to find more chocolate; ZenKitchen’s homemade chocolate truffles. A perfect end to a delightful meal. 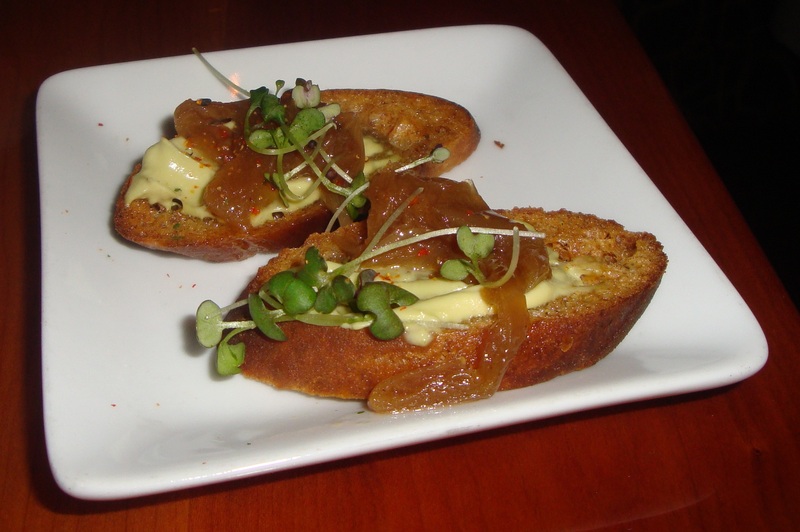 Seitan: An excellent gateway food to give omnivores.